In southern Africa, a strong fence is not making for good neighbors. The government of Botswana has been erecting a fence along its shared border with Zimbabwe ostensibly to keep out cattle with foot-and-mouth disease. But many argue that the real objective is to keep out illegal Zimbabwean immigrants who are desperate to flee from the deepening economic and social crisis in their country. Filmmakers Peter Hutchens and Ryan Hill traveled independently to Botswana and overcame many challenges to report this dramatic, developing story — a story that has received virtually no major press coverage. In this interview, Hutchens and Hill talk about their experience making “Border Jumpers” on location in Botswana. 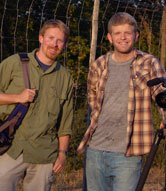 Hill: Peter and I were working as cameramen at a Discovery Channel reality show. We met at the wrap party and Peter said we should work on a project together. I read in the Economist World Book just one line about this fence and, knowing how controversial fences always are, we did some research and found some articles. One said that a BBC crew was kicked out of the country trying to chase this story. We realized that no one was going to give us money to go shoot this, so we bought plane tickets and went. We didn’t have any contacts on the ground and just got into Botswana and started pursuing leads. How much time did you spend there filming? Hutchens: Last year we were there for a month — from May 15th to June 15th — and then we were back this year for two weeks. You both had experience with this part of the world before? Hutchens: I grew up all over, in different countries — in China, South Africa, and the Philippines. But the years in South Africa really stood out in my mind. We were there during the last years of apartheid, and it just really gave me a love for South Africa and the interest in Africa that has really stuck with me to this day. Hill: I had been to Zimbabwe several times and, having seen it crumble more each time I went back, I have always wanted to do a piece about Zimbabwe and about the farmers being evicted. And there was definitely a strong interest with this piece as a way to talk about Zimbabwe. But in making this film, you were prohibited from entering Zimbabwe. Hill: We were right at the border and shot into Zimbabwe across the border, but even the people who we worked with and interviewed just had such a huge fear about word even getting out that they were scared to death just talking to us. We very much wanted to travel with them in Zimbabwe, but Zimbabwe isn’t exactly friendly to journalists these days. Even in Botswana, however, you experienced resistance to your filmmaking. Hutchens: When we went to Botswana one of the things that really surprised us was that no one was really covering the story. Also, the Botswana government, I think, was quite sensitive about us covering issues related to Zimbabwe. Any mention of the fence very obviously scared the Botswana government, because for them it’s an agricultural fence, and they were saying that they were unfairly treated by the international media and also by the Zimbabwean ambassador to Botswana, who had called it the next “Gaza strip.” So we really had to work hard to get approval from the Botswana government to pursue it. But eventually we got into all the places we needed to. We went out with their military and got into the Center for Illegal Immigrants and were able to cover the story. What kind of technical support did you have down there? Hill: We’re very mobile in the way that we work and that’s one of the things that drew us to each other and the project. We are both cameramen and we can both edit and we have our laptops and our cameras, so we could pretty much cover any story anywhere. So it was just the two of us and our mobile stations. This documentary is structured around strong “characters” — including Solomon, a Zimbabwean who repeatedly crosses the border and is repeatedly deported; a white cattle farmer named Japie Strauss, who mourns the loss of his herd; and a black migrant worker, Mary, who sings beautifully as she labors under very difficult conditions. How did you find these fascinating people? Hutchens: One of the things we wanted to do was to portray the conveyor-belt cycle, as they call it — to show how Zimbabweans are deported and then come right back. So when we first got into the Center for Illegal Immigrants and all the prisoners were gathered around us, we asked them who has been there before and everybody raised their hand. Then we asked, “Who is coming back again as soon as you’re deported?” and again everyone raised their hand. And so we just had to kind of pick one, and we wound up with Solomon. And we were allowed to film the whole process of him being deported, and we told him, “When you come back into town, find us.” But it was three days before we heard from him again, which was later than we had expected. And he said that he was arrested and deported again since we had seen him. So that’s how we found Solomon. Hill: Japie Strauss — we were in a parking lot and saw a white woman and asked her if she knew any of the farmers who had been affected by foot-and-mouth. And she gave us Japie Strauss’s name. So we just drove out as far as we could get to the farm. When we hit a riverbed we couldn’t cross in our VW, we walked a couple of miles into his farm. And he wanted to talk about the way he lost his cattle, so he invited us to come back and spend the weekend. And then while riding in the back of Japie’s truck, we met Mary, who actually works for him at times. So, it was a pretty organic process. Not everyone you tried to interview was so friendly or cooperative. Hutchens: People are pretty reluctant to mention what’s going on back home in Zimbabwe. And at one point, I went out to a settlement of illegal Zimbabweans on the outskirts of Gaborone, the capital of Botswana. We wanted to see if there was anybody who could speak more specifically to why they were coming to Botswana. I got there around dusk, and it got dark quite quickly. And when I began talking to these guys, they started venting their frustration against American journalists, the BBC, international journalists, everybody. They just said we were there to exploit and not to help. And the situation turned bad fairly quickly. And it ended up basically in a scene like you see in the movies or something, where I was getting into the car and they began to rock it and hit the windshield, and it was kind of a difficult situation to get out of. But you can understand where these guys are coming from. They’re so frustrated and they have nothing to return home to. And I think that that night we became the object of their frustration. What do you say in that kind of situation? Do you try to explain yourselves? Hutchens: What I said to them was, “I can’t force anybody to talk to me.” They asked to be paid. I said, “I can’t pay anybody. But if anyone is willing to talk with me, I really want to understand and I want people that watch this in America to understand where you’re coming from and what your feelings are.” I did stress that I’m not the U.S. government or a European government and if people don’t hear your story then they have no way to understand or relate to it. WIDE ANGLE will put this on the radar. Hill: I think that’s one of the most frustrating things, was letting people know that we wanted to help get the word out about Zimbabwe when a lot of them are used to being exploited in different ways. That was a tough thing to communicate. Why do you think the press in Botswana is not covering this story? Hutchens: As one of the border jumpers in our film points out, Africa is really afraid of pointing the finger at Zimbabwean President Robert Mugabe. South Africa’s not speaking up about it. Botswana, Mozambique, all of the countries around there are just allowing Mugabe to go on. Botswana is a small country. They are a small, promising, prosperous country. They’re kind of a model for New Africa. But there’s only 1.7 million of them, and Zimbabwe’s next door teetering on the brink of collapse and it’s got close to 13 million people. So Botswana is legitimately scared that they’ll be overwhelmed by Zimbabwe’s problems if they say more. Hill: The average person on the street in Botswana fears that they’ll be overrun. Government estimates are about 130,000 Zimbabweans in a country of about 1.7 million. When you look at the fact that they rounded up 1,500 Zimbabweans in a city of almost 100,000 in just one weekend, it really shows that they have a valid fear. As you were filming, or after you finished, did you come to any conclusions about a possible solution to the problem of the border jumpers? Hutchens: Ryan and I recognize we’re not experts on Africa. We don’t have a plan for how to solve this situation or the problems, but we do know how to tell people’s stories, and we’re hoping that if people are just more aware of what’s going on there, then the people who are in positions to make decisions in our government, in Africa, and in Europe will be better informed, or at least will care about the situation. That’s our hope. Had you been familiar with the WIDE ANGLE series before you began shooting this project? Hutchens: We knew about WIDE ANGLE, and we kind of thought it was a little out of our league, to be honest. We had looked at it and thought that would be a great program to work for in 10 or 20 years. So it’s pretty amazing to us that it’s all come through and that the project’s going to be airing on PBS this month. What’s your opinion of the coverage of foreign affairs in the American media right now? Hutchens: It’s very difficult to interest American broadcasters or the American audience in international stories, especially in a place like Zimbabwe that sounds so far away. But we were really just struck by how close this is to home, all the stories and all the people, their experiences. We knew that if we could get them onto a screen somewhere and get someone to watch, that we could make an American care about a person in Zimbabwe or Botswana. Hill: We’re just thankful WIDE ANGLE exists, because I don’t really know who we’d be selling this story to, if not WIDE ANGLE. We had looked at some other outlets and realized it was just far too obscure a story for them to care about. I think that if we had known how narrow the field is for a story like this, we might not have done it. But I think it’s the perfect fit for WIDE ANGLE.